Few details are publicly known about the crash at the moment and we should not jump to conclusions. The police is looking for witnesses – if you saw something, please get in touch with the Road Death Investigation Unit at Alperton on 0208 998 5319. I don’t mind if you also report what you saw in a comment on this blog. My office is a few hundred yards further up close to King’s Place and I cycle regularly in the area. The whole area around King’s Cross is a complete and utter nightmare for cyclists. As my statistics about cycling fatalities show, in the last five years, four cyclists were killed in the proximity of King’s Cross / St. Pancras. In 2006, Wendy Gay was crushed by a lorry as she rode in a cycle lane on Euston Road close to the British Library. Also in 2006, Emma Foa died after she was run over by another lorry on Goodsway. And now Min Joo Lee died. This turns the King’s Cross / St. Pancras area into one of the worst death traps for cyclists in London. For a number of reasons, this is no surprise. First of all, because motor traffic on the Ring road is horrific. The road layout around King’s Cross / St. Pancras makes matter much worse. Everything is ridiculously car-friendly. A nasty system of one-way roads and other restrictions makes it amazingly hard to avoid the busy roads as a cyclist. Apparently, nobody who is responsible for the road design in that area ever seriously thought about cyclists. What is urgently needed is a clever system to lead cyclists securely around King’s Cross / St. Pancras. The best option would be to close Pancras Road for motor traffic at least in one direction and turn the space into a segregated, two-way cycle lane. The current option for northbound cyclists – York Way – is a complete nightmare, and Pancras Road is completely jammed with cars. Southbound cyclists have to use Midland Road, which is only slightly better than York Way. The least thing traffic planners should do was opening Pancras Road for southbound cyclists. I personally try to avoid the busy roads around in this area (and everywhere else in London) like the plaque. Working out the routes takes some effort (a handheld GPS device mounted on your handlebar makes things much easier), but I think it’s really worth it. I’ll blog about some alternative routes in that area shortly. And please, please: Stay behind lorries, never try to pass them on the left at a junction. Excelent article. But thit time, according to witnesses reported in the Evening Standard, the “cycling up the inside of the lorry” didn’t apply in this case. Aparently, it was the right back wheel that hit her. Good post Olaf, thanks. Very sad to hear about Joo lee. For southbound routes, the Caledonia Road and Ossulston St are not bad alternatives. Northbound, York Way seems to be about the only option. A sad day indeed. Looking at your map with the little black pictures of lorries on it is just harrowing. The whole of that road system is just a horrible place to be; for drivers, people on foot and indeed for cyclists. It is broken, it doesn’t work, and has no place in a 21st Century city. I wonder how many people have to die (FFS!) before our powers that be realise this and try to fix it. its quite saddening that it is all females that have died around the area, and in fact around London the statistics suggest it is mainly females that suffer fatalities. I don’t want to open this up into a man vs girl arguement but surely there must be something aside from the road conditions, poorly driven cars/HGVs etc that is causing this. What is the common factor with the women that have died in cycling accidents in London? Why do men not suffer the same number of fatalities on bikes? One thing that I can think of is that some women ride heavier and less agile bikes than men, mainly because they look nicer (nothing wrong with that) and is it this that is potentially slowing them down at junctions or in situations where a slight burst of speed would get them out of trouble and likewise a quick squeeze on well maintained brakes bring them to a safe stop. Does anyone have any data on the types of bikes being ridden by those involved in accidents? This is just one hypothesis, I’m sure there are many more. Whatever it is, lets find out, because lets not have more people dying and lets not have anymore women being part of a terrible statistic. @youngdonkey I’m not sure if women ride utility bikes because they “look nicer”. I ride a heavy Dutch bike because it is the most practical bike for my needs. I think we should avoid looking too much at why it is women especially who seem to die in these incidents and focus more on the fact that “sharing the road” with massive vehicles which cannot see us by design is no kind of sharing at all. I’d rather focus any campaign on reducing the source of danger; that way, hopefully, one day we can have a city where anyone, male or female young or old can get around safely on any kind of bike they like. totally agree we should eliminate the source of danger. But as cyclists we should also elimante our own sources of danger to ourselves, if you know what i mean. we all know that campaigning is good to generate interest, but with a highly political system in London, nothing is really ever done to benefit cyclists in terms of infrastructure. The motorists always win. I bet the response to our campaigning in this area of London will be a sign on a lamp post saying ‘think bike’ and that will be that. no one will be able to read it and it will achieve nothing. regarding sharing of the road with large vehicles that cannot see us, maybe one step forward is that by Cemex the cement company. I read somewhere that after one of their mixers killed a cyclist they invested heavily in new warning systems on all their fleet. It basically starts shouting at you really loudly and lights start blaring when you come anywhere near the truck and the drivers dashboard goes crazy with warning lights/alarms. I actually rode up next to one of these one week and was impressed at how it reacted to cyclists and I did the right thing and moved away. This should be law and fitted to all HGVs and buses in London. If they don’t have these then they don’t enter the city, simple as. Again questions arise, who will enforce? Who will take it up? Where will the incentive be for haulage firms? etc etc etc. @youngdonkey As an experienced female cyclist who also avoids cycling up the inside of lorries like the plague, I can tell you that my near death experiences with HGVs have occurred when the lorry accelerated to overtake me on a left-hand turn or on a roundabout. That is, I’m moving at a decent clip, they put their foot down, then turn left, right in front of me. They underestimate my speed when they do this (or overestimate their acceleration), and I have had to brake severely in order to survive more than once. If one cannot brake fast enough, and there are railings on the left, one’s odds are severely reduced. I have long hair, and often cycle in skirts (cycling shorts underneath); neither of these features slow me down. From my experiences, I have begun to suspect that drivers notice my femaleness and assume that they should be able to overtake more urgently and easily than they would a male. That is, I am assumed to be going slowly. I am not. Because of this, I am placed in dangerous situations by drivers who are trying to overtake. This is very interesting and something I had not thought about and on reflection has happened to me many times. maybe motorists needs to realise that actually cyclists are faster than they are at junctions and this causes hazards, skirted or trousered! I completely agree with this theory – I am also an experienced female cyclist in London and there have been countless times motorists, overtake and then turn left, it is infuriating. Some motorists seem to completely misjudge a cyclists speed, and typically there are no police etc around. There have been lots of similar incidents, where i’ve been cycling infront of a bus (and very clearly visible), and the bus will try and cut in front of me pulling into the bus stop. Several times i’ve had to jump off my bike with people on the bus shouting at the driver to stop!. I’m quite appalled at the way in which some bus drivers (not all, some are actually very aware) think they can get away with this, its just outright dangerous, and I feel quite powerless to do anything about it. Bar shouting obscenities, and wishing there was a police officer to witness, what can we do? Pancras Road ( http://g.co/maps/5rjr2 ) – the one which runs between Kings X and St Pancras stations – is also horrible. It should be a quiet cut through, but has turned into an access road for the station: a taxi rank and dropping off point. Cue lots of traffic as people don’t fit into the parking places, people opening car doors without looking – and a new addition to stop ppl trying illegal U-turns: a massive, solid barrier along the centre of the road, making it impossible to pass vehicles on either side or even to get out of their way. The pavement is very wide, and it would have been easy to build in cycling facilities, in order to make it easier and safer to reach the station and beyond. @youngdonkey: i remember contributing to a research project about a year or so ago, which aimed to establish why so many more females than males were being killed or seriously injured while cycling. i gave my email address in order to receive details of their findings, but haven’t heard back yet. do you happen to remember who or what organisation was carrying out this research? “In 2007, an internal report for Transport for London concluded women cyclists are far more likely to be killed by lorries because, unlike men, they tend to obey red lights and wait at junctions in the driver’s blind spot. This means that if the lorry turns left, the driver cannot see the cyclist as the vehicle cuts across the bike’s path. A cyclist was also hit on Waterloo bridge on the same day – twitter suggests a possible fatality but not seen this confirmed anywhere. If not a fatality, it was certainly serious as the whole bridge was closed for several hours. The roads certainly feel like they are getting less safe – I was hit today by a taxi who suddenly stopped and reversed parked into a space without checking mirrors – luckily I was able to hop off my bike into safety but my bike went under his wheels. I am in the same year at Saint Martins as this poor girl, she was killed on her first day back at university. She wouldn’t have died if our campus hadn’t been moved to King’s Cross. The students and teachers on the fashion course didn’t want to move from charing cross and it’s completely irresponsible to move students to an incomplete building that is surrounded by building sites. I would be interested to know if that lorry was from one of these sites on the king’s cross redevelopment area? Hi, I am a journalist on the Camden New Journal. I am writing another piece this week and I’d like to speak to you about the campus move angle you have mentioned. thanks for this article – on my first night in London I almost got hit twice by two lorries at this junction. its really dangerous. Thanks for the post. My condolences to Ms Jee’s family & friends. I recently moved from the top of York Way. I regularly cycled south taking Camden Sq., St Pancras Way, Royal College Street and Ossulston Street, which is much nicer than York Way itself. Euston Rd / Pentonville Road is one best avoided. There are reasonable alternatives, the canal to the North (from York Way to Angel) and the back streets of Bloomsbury (eg. Tavistock Pl.) to the South. As with most back street options they are not the fastest route and require pre-planning and maps. TFL needs to think seriously about investing in segregated “superhighways”. Direct *and* Safe. Her name was Min Joo Lee, which I think should be written correctly. She was indeed a student from Central Saint Martins, my classmate and a very inspiring person. She was riding a fixie and was always careful and aware. I’m really surprised that the driver of the HGV “was treated for shock” and is not being put to prison. Thank you for your comment, I corrected her name. Unfortunately, in London it is very common that drivers who kill cyclists get away with a slap on their wrist unless they drove under the influence of alcohol or were speeding. Some hair raising examples: klick , klick, klick. Great information on your blog. Too many accidents for cyclists. I find the black cabs a problem, they seem to try and cut you off some days. I’m an experienced female cyclist and it was my daughters first day back at CSM last Monday, so I am twice affected by the sad news of the loss of Min Joo Lee. I was recently stopped by police in the City and invited to sit in various HGV vehicles that increasingly chock our city. The idea was to make cyclists aware that they cannot be seen. This was shockingly the case- drivers are completely blind even if you are in front of them in the ‘cycling box’. The emphasis from the police was this is how it is and it’s your fault as a cyclist if you get injured, more likely killed. It was an awareness campaign with good intentions, but it made me upset that we live in a world where lorries are designed without any thought for people, not just cyclists but pedestrians and children. Business over people! Firstly my thoughts and condolences to the girl and her poor family. That junction is a nightmare, I have the privilege of it using everyday..along Euston Road, then up York Way, skimming along the white line of the bus lane whist trying not to get run over by motorised traffic hearing past at way faster than 30 miles an hour, not indicating etc. Even blasting off from the advanced lights spot, hitting 25-30mph by the time I get to the station trying to get some clearance from traffic is not enough they’ll hurtle past me indicate into York lane without a care for me or other cyclists. With buses pulling out constantly, peds running for trains right across the junction and not looking and with motorised traffic seeming oblivious to all around them, it feels like open season on that road for cyclists. I’ve cycled for many years and cycling around 250-300 miles per week all over London but still, that one part of London road layout still fills me with dread, I know I’m taking my life in my hands every time I use it to get home. Great post, but please run your posts through a spell check next time. I’m from the Arts London News (University of the Arts weekly paper) and I’m covering a story about the recent tradegy. 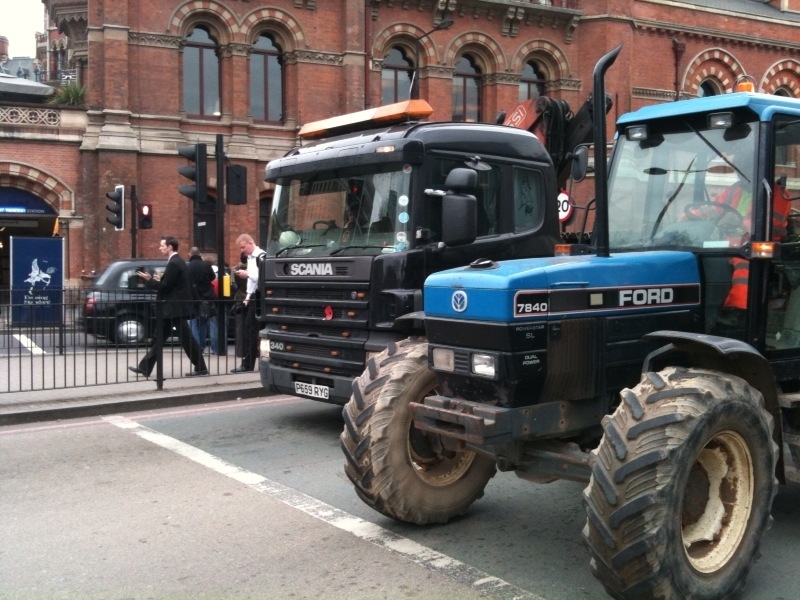 UPDATE: the truck involved came from the UKCMRI (Francis Crick) construction site from next to St Pancras station. It was a sub contractor of Laing O’Rourke, the principle contractor there. Now as someone who recently cycles past the construction site every morning, the contractor in question is Walsh. Speaking to a colleague who knows the site, he says over 100 trucks a day are doing deliveries there at present. NB the picture is Pancras Road at the junction with Euston Road. The approaches to this junction have danger practically designed in rather than designed out. Come up Grays Inn Road and a lot of the traffic want to head right to go up York Way whilst traffic coming South from Caledonian Road has to cross to the left to head along Kings Cross(Euston) Road, all in barely 100 metres of a 4-5 lane road (with a wide bus lane that cuts off just before the crucial junction, where this lot is forced down to 2 ‘minimum width’ lanes towards Euston and 2-ish (narrowing to 1) lanes heading up York Way. The opportunity should be taken, with the removal of the ‘temporary’ concourse extension at Kings Cross to claim some of the expanse of land released to provide proper bus stances. With the completion of the new layout for Pancras Road/Goodsway, the left turn from Kings Cross (Euston) Road into York Way can be banned for all vehicles except buses – traffic would then have just one left turn point – Pancras Road, and a pedestrian green phase across York Way would be better provided for. The road layout delivered for St Pancras was also pushed through without any sensible consideration for cycling – as a result cyclists use the footway up Midland Road to go North until Brill Place where on road provision begins, and the original arrangements for Pancras Road were an even greater mess that the current one, with cyclists and taxis crossing the double white line to get past the taxi queue which blocked the only Southbound lane. Oh and cyclists making a Right turn from Judd Street to get to Kings Cross. I think however you have missed a fatality – surely the Camley Street/Goodsway crash that killed Emma Foa was a repeat of another fatal crash 2-3 years earlier, and I have head of a crush crash (cyclist/artic0 also on Goodsway at the York Way end. At Penton Rise the major flaw was in not providing a positive marking to show that buses and cycles would be taking the outer lane and going straight on, and less confident cyclists remaining in the nearside lane. If a significant part of this problem is construction traffic operating dangerously it might be worth taking this up with the project management team for Kings Cross Central. Their staff has a high percentage of regular commuting cyclists, who are unlikely to be happy if they find contractors neglecting the ‘duty of care’ element of Health & Safety responsibilities – and Road Traffic law especially where this relates to ‘soft’ road users. Excuse typos – typing offset from keyboard. Correction I see that it is another nearby site is UKCMRI part of the development behind the British Library? I saw an large tracked machine being delivered on a low loader trailer to Brill Place and emphasising the Harley Shelock observation of too big a truck in too small a street it effortlessly demolished and ran over the illuminated bollard and traffic island – naturally no one bothered to replace or repair it with any sense of urgency. In terms of observation (and use of hearing by ALL road users). I was cycling along a main route and spotted a tractor & trailer at a road on the right, rolling forward but with the driver clearly not looking in my direction. I used my RSM audible warning of approach/presence with a few choice adjectives, but he carried on out and forced me to divert into a turning on the opposite side of the road and ride around over the footway shouting at full bore – eventually this noise must have penetrated the sealed environment of his cab or he saw me in his n/s mirror as he then stopped, but seemed unrepentant for his dangerous move. Notice though that many professional drivers will always drive with their side window partly open. This is a huge safety benefit, as it means, even for a car driver, you can hear key sounds, like the tyre noise of the car immediately alongside that is sitting in the blind spot of your mirror, as you consider changing lanes on the motorway, or you’ll hear the bystanders shouting for you to stop because of the danger you have/are about to cause. I agree with all that is said, if you want to bypass the Euston Road you can use the segregated bike path which runs from Tottenham Court Road in west all the way to Grays Inn Road and cut back towards Kings Cross up Gray’s Inn Road turning right off Grays Inn Road there are number of quiet back streets (like St Chads Way) to miss the nightmare that is the Kings X road layout. Problem with that Richard – Using Euston Road and TCR underpass is frankly the fastest and safest route KGX-PAD via Bishops Bridge and Eastbourne Terrace, Timings roughly 10 min flat out 15 min relaxed pace. My daughter had some cycling lessons run by Camden Council which took in that area (of course, since they started at the Town Hall) and she said that it was the scariest place she’d cycled in – and she’d even done Hyde Park Corner! The bike is now gathering dust in the garage but that’s another story. I’ve heard it said that one reason there are fewer fatailities in the Netherlands is because nearly everyone, including motorists, cycle as well. I’ve long thought that a few cycling lessons ought to be part of the whole driving lessons routine – you don’t get a drivers licence unless you’ve done a cycling proficiency test as well. I know, it wouldn’t be very popular especially with the local papers who reckon there’s a ‘war on motorists’ (not the CNJ usually) but I bet when someone first suggested motorists should have a licence or pass a test it wasn’t very popular either. And yes, all lorries ought to have verbal warnings. Kings Cross is very noisy with the ‘this vehicle is turning left’ warnings I can hear in my office, but saving lives is more important. I was deeply saddened by the death on the 3rd October, of 24 year old Min Joo Lee a fashion student form Central St Martins who was killed riding a ‘fixie’ bike, by a construction truck servicing the Kings Cross site. The 13th cyclist to be killed in London this year. I would like to put up a ghost bike in her memory, I’ll try to get hold of an old bike from Cyclesurgery who are just up the road. If anyone was interested in helping in; stripping the bike down, painting it, creating a sign and perhaps helping me buy a couple of locks and some paint if I can’t get them from Cyclesurgery, I’d be grateful. I think the Kings Cross lamppost where flowers have been left, would be the appropriate place to fix the bike. A bicycle fixed vertically there would not I believe be a visual hindrance to anyone. I will contact the police, Camden, the mayor, TFL etc… of my plans. So St Martins and others in design can we show the haulage industry that a truck with the driver at the same level as all other road users, eliminating a huge raft of visibility issues, can be built, and offer some other gains – for example a low height and ground hugging features – possibly retractable or compressible can reduce drag (I did a project on this with a major parcels operator which indicated a payback on fuel savings in under a year) Let’s provide a real memorial to Min Joo and all who died by designing out the features of a truck that make it so easy for the drivers to kill with impunity. A cheaper to operate, safer to use (how many drivers are injured climbing in or out of those high cabs?) truck might lead the hauliers to change with that most powerful of incentives – money. Could we design one? Even simple features like full height glazed nearside doors, seem to be a potential lifesaver. I also wonder whether a modern equivalent of the lifeguards fitted to tramcars and early buses – ‘curtain’ of horizontal slats, hanging down on chains or straps might be a design detail to work on? Now to buses – I’ve also had this issue. One key safety message that no one is taking seriously is to make the only contact you have with another road user eye contact. I try to clock the bus driver coming up behind me full in the eye through a lifesaver look though the windscreen – It can involve my use of greater manouevrability as a cyclist to pull right (out of the bus lane/clear of the bus stop) so that the driver gets a clean run through on my nearside, rather than make a tricky weaving move with a big clumsy bus – it is appreciated by many drivers, and it keeps me in control of where I want to drop in behind the bus after it goes past rather than getting cut-up in the bus lane. Buses are actually an interesting case. A TRL report on bike carriage on buses TRL 592 did a review of crashes and buses actually hit more people per vehicle per year than any other class of traffic, but the slab sides and end panels – light tensioned material on a frame, deliver a vertical trampoline and keep that crucial gap small enough to stop most falling pedestrians or cyclists going between the wheels. The slab sides mean that you have something to thump against (passengers get a bit upset – even if the driver is an absolute ) and with flat, wide bars you can lean into the side and slide to the rear as you brake, rather than risk the railings or bus shelter glazing. This also leaves clear evidence that you were cut up, and as TfL contracts now have all buses required to have external cameras it should be recorded. Act fast for CCTV as most systems write over the digital data every 7-14 days, so use the direct contact with the operator which has (by law) to readable from the nearside outside the bus in 1″ letters. I understand that you are entitled to obtain any CCTV images in which you appear, and someone might post a guide to this. If the issue is really serious, all buses have an emergency engine stop, and for many this locks out the fuel supply until reset, or cover is shut. Hit the button and get the Police. Arriva, and I suspect most other London Buses contractors issue drivers with ‘Section 170’ cards that fulfill the legal requirements (RTA s.170) to provide details to any person reasonably requiring them when the PRESENCE of the bus (not just an impact) has caused damage or injury. At present though, it does not seem to be a universal requirement, but it does provide a way to remove the potential of a heated row at the roadside to a measured review of the facts later on. It also prompts the idea that the law on statutory lettering extends to trucks, so that the details of the operator and operating base are clearly displayed, for instant record (photo). I completely agree with you about making eye contact. Both myself and my boyfriend ride motorbikes so we understand how important eye contact is – if you can make eye contact there’s no denying that they haven’t seen you and usually you are left to manoeuvre out the way. However, getting eye contact with a driver, pulling out of the bus lane to let them scoot in, isn’t always an option – the bus driver has committed to putting his foot down past you and pulling in (more a case of they don’t realise the size of their own bus so usually you are set for a collision with its back end, and so you speeding up or pulling out is only going to cause you to get hit in a disappearing gap – It makes me wonder if they have a certain time slot to hit to get bonus or something for completing their route in a certain time, as sometimes you think, why didn’t you just wait 10 seconds for me to pass the bus stop rather than cause this scene. There isn’t a huge amount a cyclist can do if a lorry/van/car/bus decides that they are going to accelerate round you, I certainly know my acceleration is no match for a vehicles acceleration. Your post is very interesting, and I think slowly buses are starting to learn and take notice of cyclists on the road, but I sometimes think they simply forget, or have a bad day and think, nope I’m not letting you out, or nope I’m not waiting for you… we’ve all had days like that to an extent I imagine, I just always wonder, hmm I wonder how you would feel had you hit me. I bet you would be sorry for cutting me up then! Actually, I’m slightly surprised by your impression about TfL buses. My experience is that the vast majority of them are driven in a very considerate way. I rarely have a nasty experience with them, as I described in this blog post. Lorries, vans and private hire cabs are a completely different story, though (most black cabs are ok, from my point of view). In a recent edition of LCC’s magazine was a story about the cyclist awareness training bus drivers are receiving. I think that – by and large – London bus drivers are really doing a good job. Really? – Some drivers are fine, but there are a few that have been terrible – mainly down the Walworth road / Elephant and castle, but to be honest, that’s a bit of a nightmare for anyone walking or on the road round there! I’ve been riding in London for 4 years now and there is a marked improvement, but as I said in the post, there are some instances like making a choice to pull in-front of you for what seems a small benefit that still surprise me.